On the back of this I wrote all the places I could find each recipe (whether in book or on the internet and the specific site), and on the bottom of the page I wrote all the other foods we were out of. I shopped at the Commissary tonight and tomorrow I’ll shop at Whole Foods for the turkey and the produce. 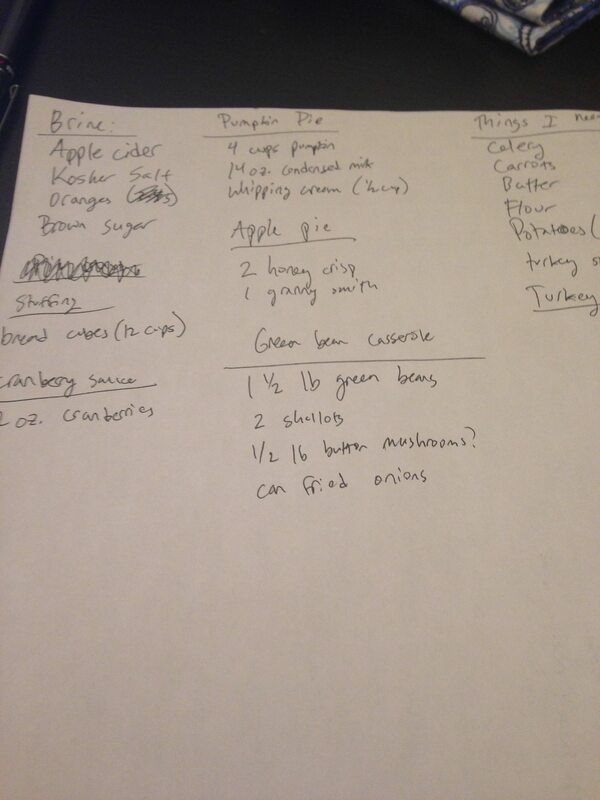 Tags: cooking, planning, Thanksgiving, Work | Permalink. I haven’t been working much recently…which leaves me with a lot of free time on my hands during the weekends. Today I made pancakes, cleaned the kitchen, did laundry, watched tv, did laundry, had an hour and a half phone date with my best friend from adolescence, made dinner, cleaned the kitchen, and watched more tv. Not what you would consider the most exciting of Saturdays. I decided to sew a bit to break up the dullness of the day. Instead of making more baby burp cloths (most of what I’ve been sewing recently) I used some of my fat eighths to make some napkins. I made 3 pretty blue ones, and ironed, cut, and pinned 2 more green ones. I’ll share some pictures later – my phone is basically dead right now. Tags: crafts, lists, planning, sewing | Permalink. 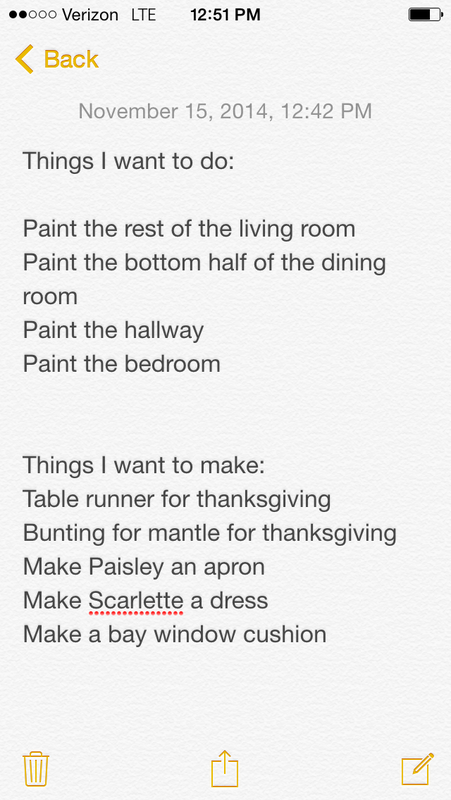 There are lots of things that I want to do around the house and a lot of things I want to make. They keep flitting through my brain and then I lose them! Today I decided to grab some of those fleeting thoughts and put them in a handy dandy note on my phone. I’m sure it will continue to grow as I think of things! Tags: crafts, lists, planning | Permalink.